I didn’t know what to expect when I saw this attractively packaged 21g product at Aldi’s checkout because it’s a pea snack but its in a crisp size packet? Well, as you can see in the pic they took me by surprise by the way they looked, I was half expecting round dried flavoured peas. But they are like crisps, like green Chipsticks! but shaped into a mini pea pod! Well, what do they taste like? Well they crunch like Chipsticks and gives you what starts to taste like Salt and Vinegar but then BAM! a weird strong Earthy taste takes over and throws you off because crisps “don’t taste like this” you think in your head and then a taste of what tastes like real peas appear in the aftertaste kind of like biting into a pea in a pod in one go. Its quite weird but after a few of these light crunchy “crisps” you get to understand the taste more and start to get it! Its a pea snack, so it supposed to taste like peas! and it does at the end and in the aftertaste. Do I like it? Kind of a tough question. Its just very weird, maybe my brain is not registering properly and has been thrown off by these veg tasting crisps but I did find myself eating more and more, faster and faster and as that happened they became more like regular Chipsticks, like a Pea/Veggie version. possibly. I feel like I’ve just tried someones peas from the allotment for some reason. But do I like it? I don’t hate it thats for sure and the salt and vinegar flavour which isn’t too strong but assists and helps the flavour helps and yes, I think I might like it, I may have to buy more just to see if I really do or is it because I’m just curious about the taste. Either way, I just want to remind Coeliac sufferers that this product is also Gluten Free and for Health watchers its only 13% Fat which is much lower than a regular packet of crisps and has much more Fibre in. This is an intriguing product that may be worth a try buy you guys and let me know what you think. Low in salt, little to very minimal fat content and gluten free, a source of protein , what more can i say apart from a totally healthy snack that you could eat in a calorie controlled diet. I agree, they are a fab snack for a low fat calorie controlled diet, just a pity they aren’t sold in multi packs. Love them. Aldi now sell the multi packs for around £2! Loved them. Usually gluten free products are tasteless but these are great! I had a bag of these a few weeks ago – I really loved them. As an avid snackaholic I really should eat more of these – onlyu trouble is my nearest ALDI is 80 miles away so I don’t get there very often. Bulk packs/larger bags would be great. Aldi to a fantastic gluten free range, I noticed these Pea Snacks – sweet chili flavour ..
Love all the flavours, as one who is on a weight loss mission I ffind eating a few of these pea snack pods satisfies and negates any thoughts of regular crisps. They sell six packs of these in my Local Aldi and I’m addicted! You can buy single bags of sweet chill or salt n vinegar, and six packs of either chilli and lime or Malysian sweet curry. They have become my go-to snack and I’m in love. Came across these today. Looked at the nutritional info and was astounded. Really healthy and a tasty crisp. Great effort producing the product, I’m telling everyone I know to try them. I have the sour cream and chive ones and they’re devious. Picked up a pack of sweet chilli at the aldi checkout n rather like them, n low fat, so could be persuaded to try other flavours. The Chilli ones are by far the best in the smaller bags. They do two flavours in the ‘share (lol) size ‘ bags, Thai red curry and sour cream and chives. I agree they need a multipack. I have tried both sweet chilly and Vinegar – they are so yummy. I agree they should be in a multipack or a larger bag. I tried the sweet chilli pea snacks this evening and absolutely love them !..And as a bonus they are full of protein and very good for you …Multiple please ? Absolutely love these pea snacks. Great taste. Just yummy all round. Thanks Aldi. I love these pea snacks. Anyone know the syns value for slimming world followers? I’m trying to find.out the Syn value also. They can’t be too high because they are low fat and.low sugar. Alroubd very healthy snack and great tasting too. Hi, I’ve checked with someone in the office who is a Slimming World Member and she says it is 4 SYNS’s. Amazing!! Get the multipacks on the shelves! Salt and vinegar are the BEST!! Hey! Pea snacks people! 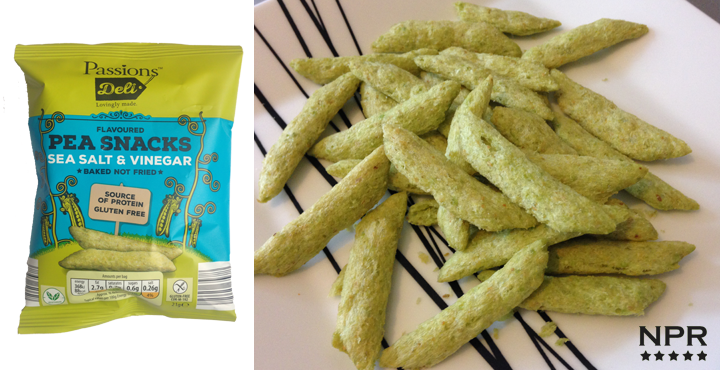 We bloody love your pea snacks! They are a bit weird but they are ACE and you deserve to get seriously rich out of your lovely PEAS! I love these, so does my husband. Like many before have said “need bulk packs” The sweet chilli is our favourite. I love the salt and vinegar version of this snack although it;s a bit claggy in the mouth. I keep buying from my local Aldi and look forward to trying more flavours. But whoever wrote the copy in the above Review needs to go back to school and learn English, There are so many errors in grammar, syntax, capitalisation, punctiation that I almost got fed up reading it. It does nothing to enhance the perceived quality of the product or company. Get it looked at by a professional copywriter. Does anyone know the Slimming World “synn” value of a packet? Hi, I believe they are 4 Synns. Why would a health watcher want to eat less fat per se? I mean, less rapeseed oil sure, but most people don’t get anywhere near enough healthy & whole food fats. I thought the low fat craze was debunked 10 years ago, at least in the cognoscenti.